Sometimes, having a family member with an intellectual disability can be very isolating. But it doesn’t have to be. Special Olympics Nebraska can help by providing families opportunities to meet other families, share experiences and learn from one another. At Special Olympics Nebraska you will find hope, celebration, pride, acceptance and support. And most of all, you'll find friendships that will last a lifetime. 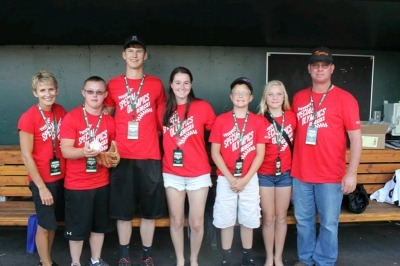 Special Olympics Nebraska families are critical to the continued success of this organization, as family members so often go above and beyond by volunteering as coaches, chaperones, fund-raisers, and most of all, vocal and impassioned ambassadors. Not only are our families providing all the love and support that their athlete needs to be successful, but they are also acting as agents of change within their communities, helping to pave the way for the next generation of athletes so that they may experience tolerance and acceptance. Together, the SONE families are making a tremendous difference through their advocacy, and in the process making the world a much better place to live for all of us. We encourage all family members of children and adults with intellectual disabilities to get involved and be a part of Special Olympics Nebraska. After all, if you are a fan of your sons and daughters, sisters and brothers, aunts and uncles, grandsons and granddaughters, then you are already a fan of SONE! If you want more information on the SONE Family Program, contact Director of Health and Community Services Alisa Hoffman at ahoffman@sone.org or 402-331-5545 ext 22. You can also send an inquiry using the form below!